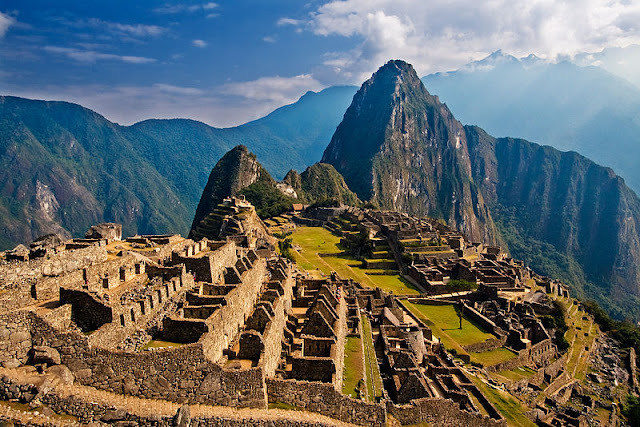 In Peru the pre-columbian Incas civilization lived at Machu Picchu an old peak near cusca. They never used wheels. But, they expertised in technique of ashlar. Ashlar is technique in which stones are fitted together without any mortar(fixing material). Mortar free buildings are more resistant for earthquakes. Because these stones will adjust them selves in such a way that they never fell down. There architecture of building such a buildings are shown in the diagram. They build well paved roads for thousands of miles. They mainly divide there empire into 2 sections agriculture and urban. They use dry stones and they are cut at regular shapes to build their houses, temples and sanctuaries. There are over 140 structures which includes sanctuaries, parks, houses temples and fountains. They started building Machu Picchu at 1400 CE. The lifespan of Inca empire was 1200 - 850 BC. In CE their tribe was known from 400 CE. City Cuzco was built at 1200 CE. Ends at 1545 CE. The city Cusco in Peru was the capital of Inca empire. The above image shows the structure of machu picchu which is the best example of incas way of living. Their calender consist of 12 months each month consist of 3 weeks each week has 10 days. They use time markers which depends on position of sun. Occasionally, time got off track a bit. When that happened, the Incas simply added a couple of days until the time makers were in line. This results in accurate calendar. They used Drums and flute. They invented Panpipes which is an arrangement of pipes lined up and connected to a flute like single pipe. This instrument was still used by the people in Ande mountains located at Cusco. 1) Wonderful Builders of Fountains, Stone-works and hanging bridges. 2) An Accurate calender method to measure time using time. 3) Panpipes, Flute and Drum. 4) They have well developed civilization because they all are fed well there is no starving. 5) They used Terrace farming. The Civil war arised between 2 sons of an Inca kind around 1500 CE. At end of that civil war Atahaulpa One of the sons won the war and turned himself as Inca. But Pizzaro brings an army of just 167 men heards from the tribals lived in the coasts near Inca civilization that Incas hold huge volume of gold and silver. So they decided to meet the new king Atahaulpa to ask help for their passage to the north. So Atahaulpa decided to meet pizzaro with his 2000 men of priests and amusers. No one was on armed, while spanish planned to kidnap Atahaulpa. During this meeting Atahaulpa get caught but most of his men are killed. Atahaulpa promised for a 22 feet room of gold for his safe release. He kept his word. But Greedy Pizzaro killed him as soon as the gold was delivered and runaway with the gold. Again they returned back with huge spanish army and invaded Incas. It took few years for spanish to defeat harsh rulers of Inca family.